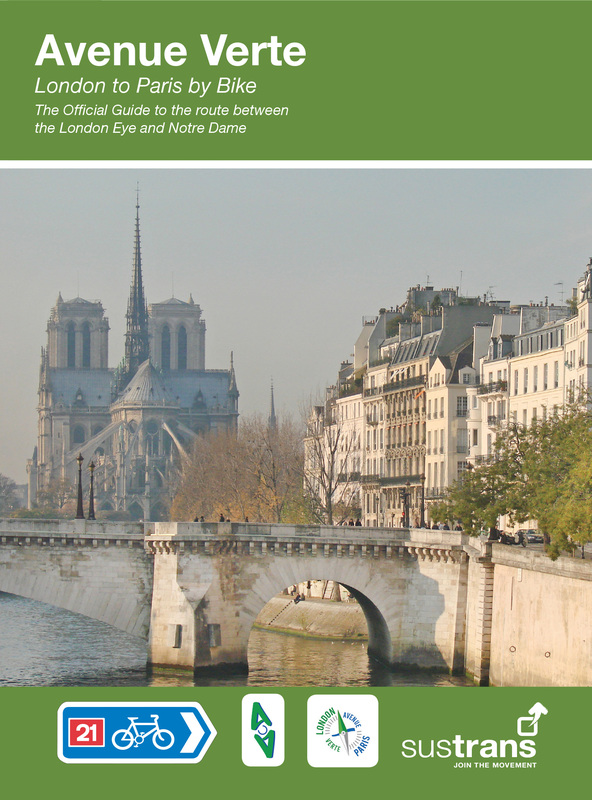 Four Point Mapping have recently completed a project with Excellent Books and Sustrans to create a guide book to the Avenue Verte cycle route between London and Paris. This is the first English guide to this route and includes maps, directions, accommodation information and other more general detail about transport and tourist attractions. It is a handy size to fit into a bar bag and has spiral binding. The route itself starts at the London Eye, follows NCN4 past Tate Britain and crosses the River Thames on Chelsea Bridge. It then heads south through Clapham and Wandsworth Commons to join the Wandle Trail at Earlsfield. It follows the Wandle Trail to the outskirts of London, traverses the North Downs, passes Redhill, Horley and Crawley before heading east on the Worth and Forest Ways (NCN21) past East Grinstead and Groombridge. It then heads south through the East Sussex countryside to Newhaven on the coast. It uses the ferry from Newhaven to Dieppe and then follows former railway lines to Forges-les-Eaux. There are two route options north of Paris. The western option is shorter and follows the Epte valley to St Germain on the Seine. The eastern option goes via Beauvais and Senlis and then follows the Oise valley to rejoin the western route at St Germain on the Seine. The route into Paris follows the Seine and the Canal St Denis to end at Notre Dame. The maps in the guide are at three different scales to suit the area the route goes through. There is detailed 1:10,000 scale mapping for the urban areas such as the city centres, and other towns that the route goes through. The suburbs of Paris and London are mapped at 1:25,000, and the rural parts of the route are mapped at 1:100,000. Maps for the English part of the route were created using data from Ordnance Survey OpenData datasets, however the French side was more tricky as the OS haven’t got round to mapping France yet. We opted for data sourced from OpenStreetMap, which caused a few technical headaches (especially the contours), but in the end proved easy to work with. 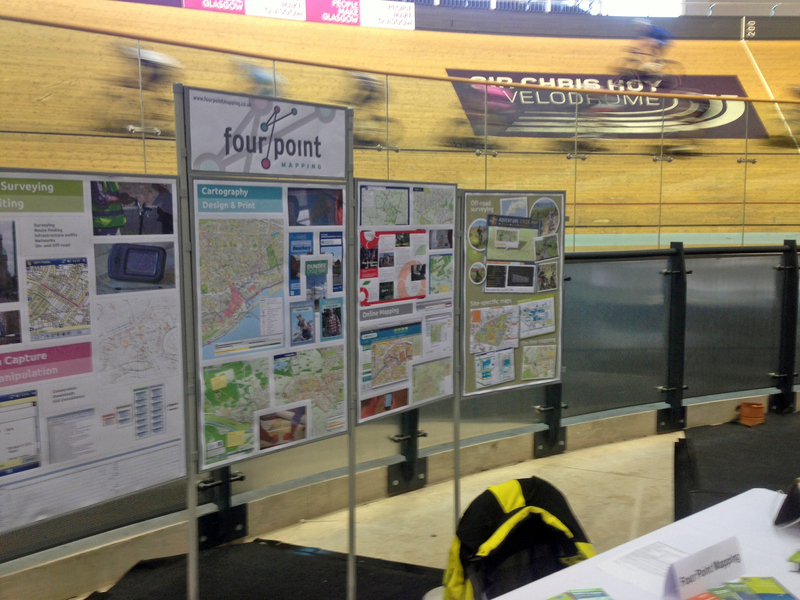 Four Point Mapping have produced an Active Travel map of Caerphilly. Before printing Sustrans have blown up the map and mounted it on the wall on a piece of Aluminium. 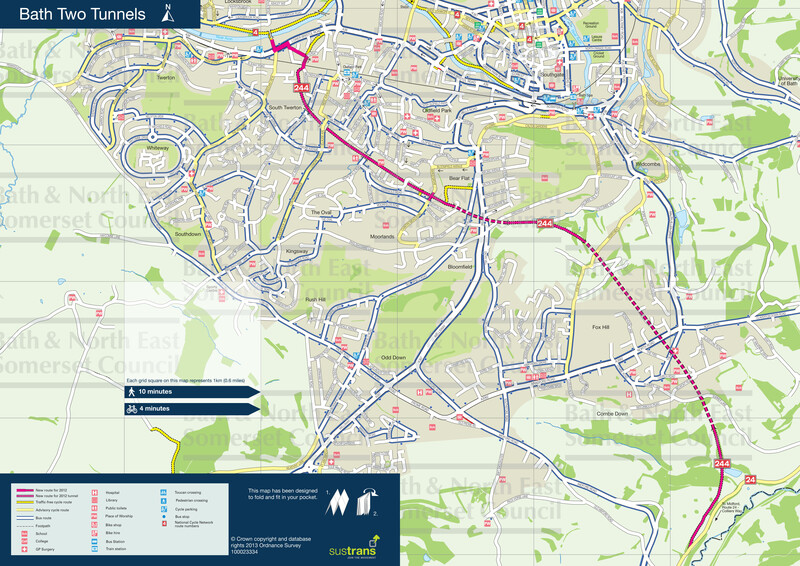 It is about 2m by 1m and shows the bus, cycling and walking networks in great detail. As a public consultation exercise members of the public can go to the Sustrans office in Caerphilly and make suggestions as to how the map can be improved. The Welsh Assembly will soon be introducing an Active Travel Bill, which will make it a legal requirement for all Welsh local authorities to produce active travel maps. 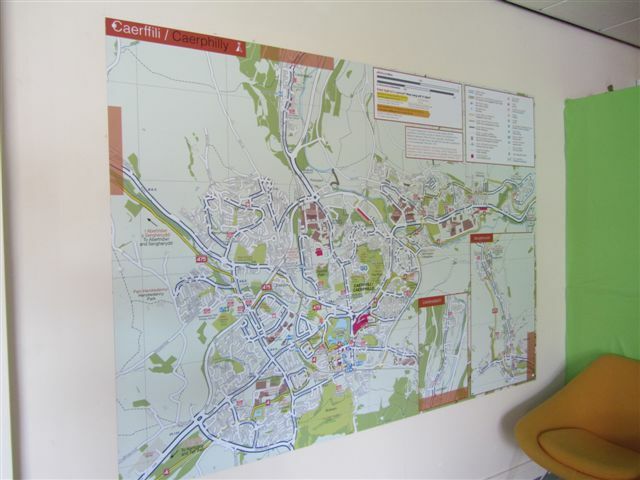 This Caerphilly map is an innovative way to engage with members of the public. 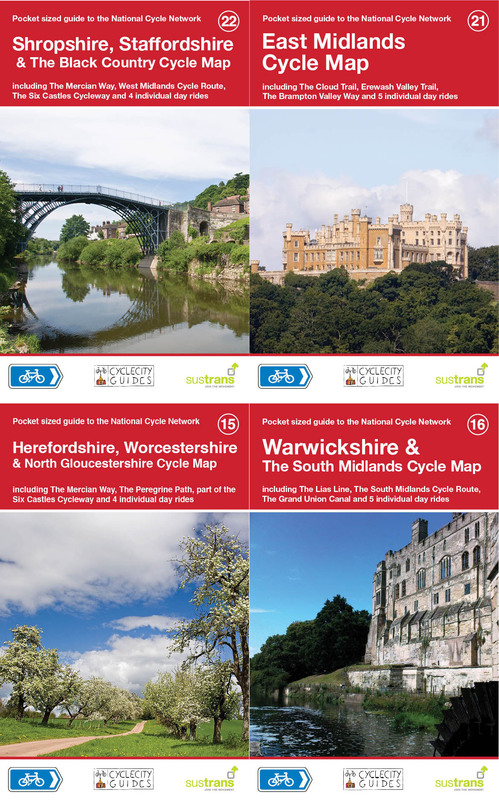 Four Point Mapping are expanding their popular cycle touring maps series to cover the Midlands. We have just completed the research in this area, so the maps will be available from late July. Four maps will cover the region, stretching from Gloucester in the south to Derby in the north, the Welsh border in the west and Milton Keynes in the east. 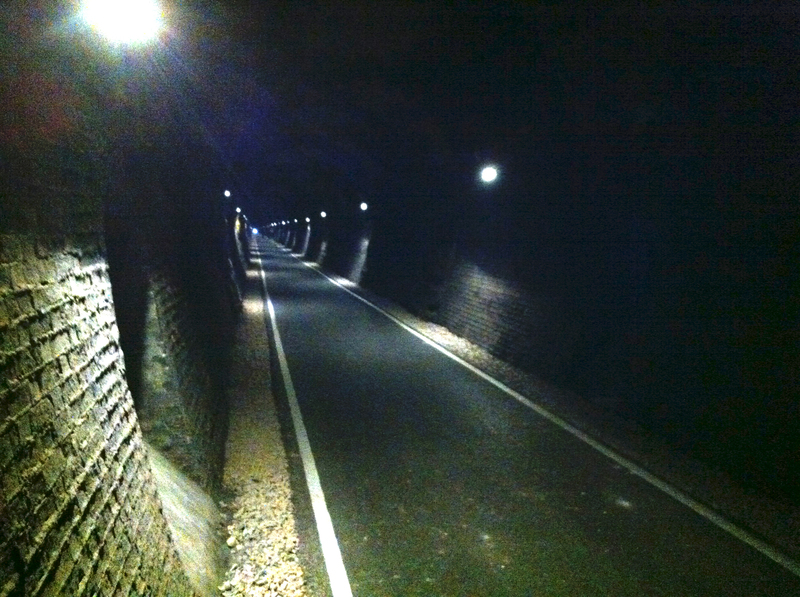 We recently blogged about the new Two Tunnels Cycle Route. However this is not the first or only tunnel on the National Cycle Network. 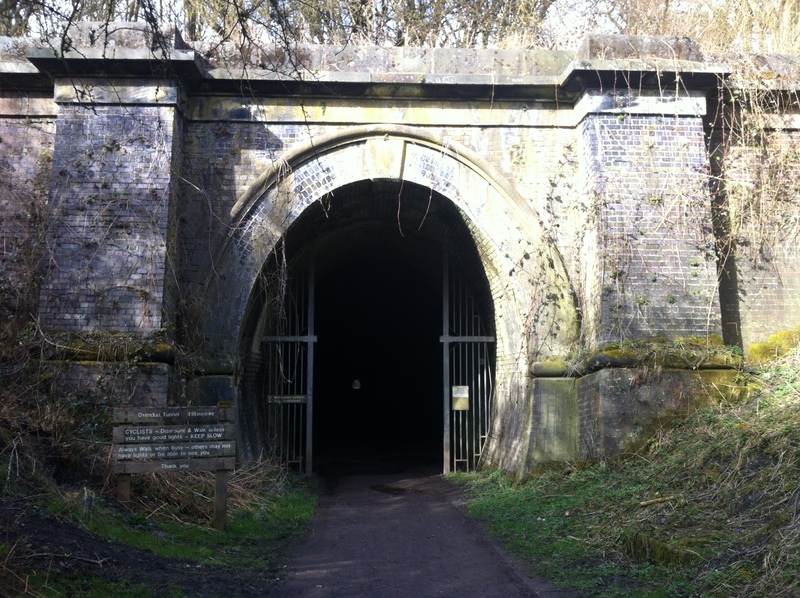 The Oxendon Tunnel near Market Harborough is part of the Brampton Valley Cycle Route on NCN6. It is only 418 metres long and is straight so you can see the other end, but it is still an eerie experience travelling through it. Half way along there is an air hole which provides a bit of light. However if you do not have lights it is advisable to walk because the surface is pretty rough. Each map shows the coverage area at a handy scale of 1:110,000. On the reverse there are some suggested day rides which shows what the region has to offer, and large scale town centre maps for easy navigation from the station to the NCN. 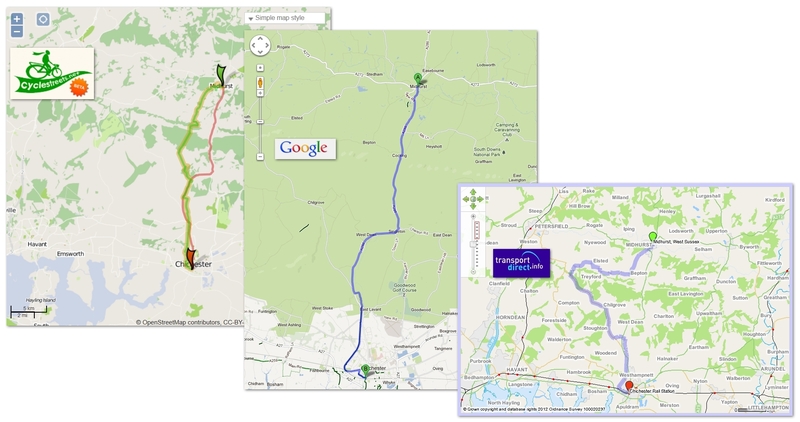 Four Point Mapping recently completed a research study of cycle journey planning for the South Downs National Park, who are looking into implementing a cycle journey planner solution for their website. There are numerous cycle journey planners out there, and they all offer slightly different features. Four Point Mapping has been involved in many of these to varying extents, which made it a very interesting piece of work for us to do. Transport Direct offers cycle journey planning alongside other forms of transport in its multi-modal site. It is a Government run site and aims to promote alternative modes of transport to the motor car. Transport Direct routing information is based on highly accurate Ordnance Survey data and provides cyclists a number of journey planning options such as a fastest, quietest and most recreational route. There are also a number of advanced features such as avoiding time restricted paths or unlit streets. Cyclestreets provide a cycling centric journey planner and is powered by Open Street Map (OSM). OSM, sometimes referred to as the ‘Wikipedia of Mapping’ is a crowd sourced global dataset and is constantly being added to. Data coverage is generally good and the journey planner routing options are impressive. Users can compare quickest, quietest and balanced routing options from a single interactive map. The Cyclestreets journey planner is constantly developed and routing information is updated regularly. Google has recently adopted cycling data from Sustrans to power its cycle routing engine. Google has the ability to map cycling routes over long distances. The journey planner is still in its beta phase. Printing options are very good, and routes can be exported to Google Earth. International Journey Planning – Four Point Mapping reviewed a number of international journey planners and assessed some unique features. ‘RideTheCity‘ – a journey planner for cyclists in New York (USA) provides cycle parking locations within a set distance of the user defined start and destination. ‘CycleCopenhagen‘, developed by Brian Haunstrup and a product of a Masters Thesis, provides a number of unique and useful features such as graphical cycling traffic volume levels and noise decibel values. A major new cycle route has opened near the Four Point Mapping offices in Somerset. 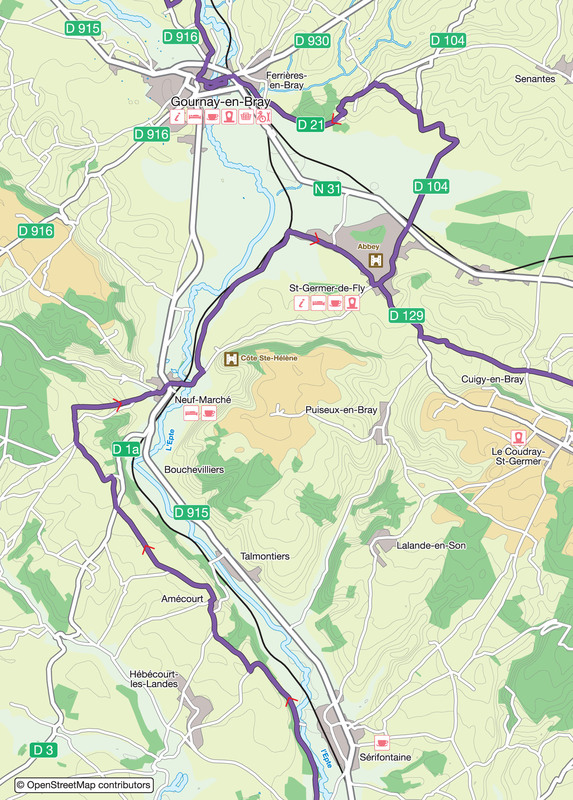 The Two Tunnels Greenway is a shared-use cyclepath which now links the Linear Way in Bath to the village of Midford, and even on to Radstock and Frome using the Colliers Way. It uses the track-bed of the former Somerset and Dorset Railway and saves a massive climb by using two tunnels. 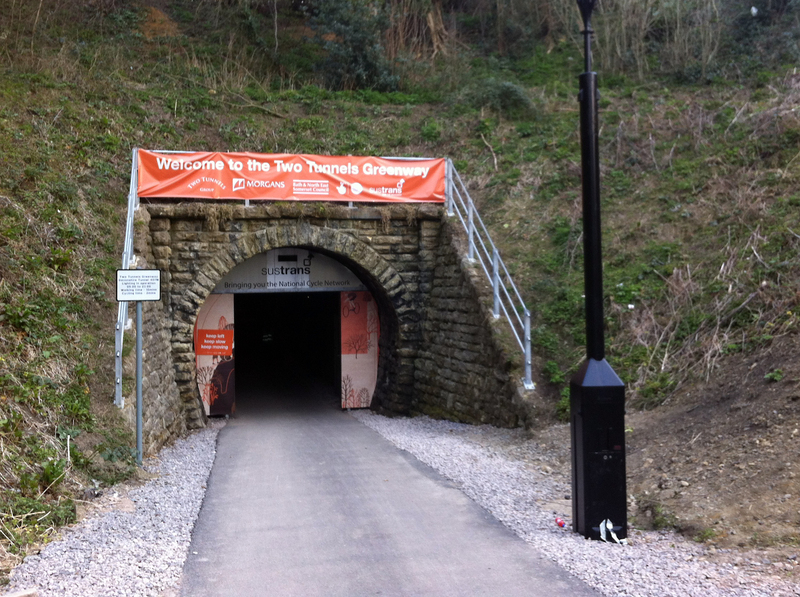 The longer ‘Combe Down’ tunnel is now the longest cycle tunnel in the country at just over one mile long. The funding has come largely from the Sustrans Connect2 project, which is made up of about 75 major projects to bridge gaps in the National Cycle Network. Four Point Mapping are producing a map of each one as they are finished. See the Two Tunnels map here. Travelling through the tunnels is quite an experience for cyclists, walkers and joggers alike. There is low-level LED lighting so bike lights aren’t needed – in fact they just dazzle on-coming cyclists so please refrain from using them! There is also piped music at certain points which adds to the atmosphere and distance markers on the well-surfaced ground informing you of how far you’ve travelled and how far you have to go – it can get quite disorientating in the longer of the two! Part of the longer tunnel is very straight and the sight of all the LEDs down either side disappearing off into the distance is quite astonishing. Hopefully the Greenway’s huge popularity will continue long into the future and get more people out-and-about on bikes or on foot in a safe, traffic-free environment.